Since 2012, the year when Butterfly Conservation purchased Rough Bank reserve, a total of more than 650 moth species have been recorded on the site and there are a few other species only recorded prior to 2012. 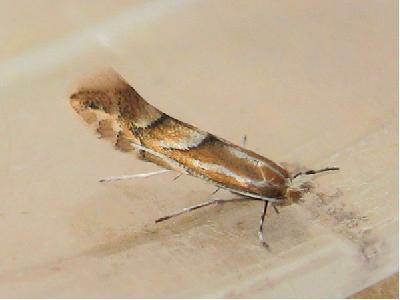 The Rough Bank Moths page gives a full species list. 49 of the species recorded at Rough Bank have nationally rare or scarce status in the UK, and nearly all of these are believed to be resident on the reserve because of the habitat and the presence on site of their larval foodplants. Many of these species have been found here at least 3 times since 2012 (the exceptions to this are indicated in the text below). Rough Bank was quickly recognised as one of the most important known sites in Gloucestershire for scarce moths. Frequent daytime recording visits since 2012 produced many of these records, and it seems likely that several other Cotswold grassland sites would be found to support similar numbers of scarce species if subjected to similarly frequent daytime surveys. 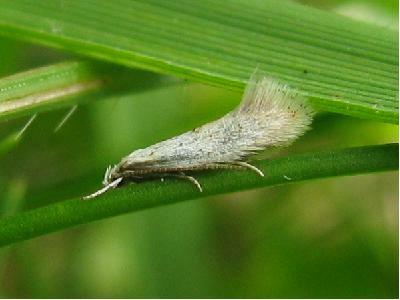 The majority of the rare & scarce species recorded at Rough Bank are micro-moths. 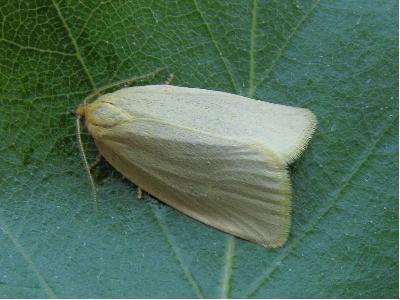 The identification and recording of these, particularly as a daytime activity, is not as popular as the recording of the larger macro-moths which is done mostly by the use of ultra-violet light traps at night. All except one of the species have been recorded since 2012, and only a few of them had also been found here in the past. Several of the species photographs below were taken at other Gloucestershire sites. National status is from the 2012 review for micros. For the macros a status review is expected to be published soon; it is likely that some macros formerly rated as Common or Local will be raised to Scarce or Rare status, whilst increased recording and changes in distribution could lead to some scarcities or rarities being downgraded. In earlier versions of this page (to 2016), Narrow-bordered Bee Hawk was listed as Nationally Scarce A having been shown as that status in one reference source I used, although it was shown as Nationally Scarce B in another source. Here it is now listed as Nationally Scarce B for consistency with the latest Field Guide (Waring & Townsend, 2017). Following the publication in January 2019 of amendments to the UK lepidoptera checklist, the scientific names of some of the species on this page have been changed from earlier versions of the page. 3 nationally rare species have been found since 2012, all resident on the unimproved grassland. These species are given provisional Red Data Book status in the 2012 review of the status of microlepidoptera in Britain. Trifurcula headleyella, pRDB2. 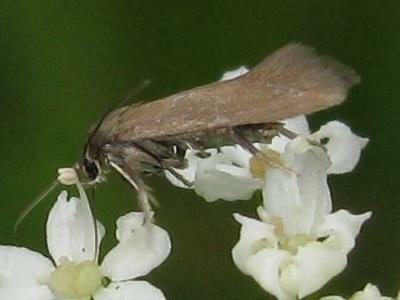 New to Gloucestershire when found here in 2012, there seems to be a strong colony of this tiny moth (photos below, wingspan approximately 5mm) with specimens found quite easily during its flight period each year. Its larvae mine the leaves of Self-heal (Prunella vulgaris). The adults can be found during the daytime, mostly from mid May to late June. Coleophora niveicostella, pRDB3. When the first specimen was found here in early August 2012 it was the first Glos. 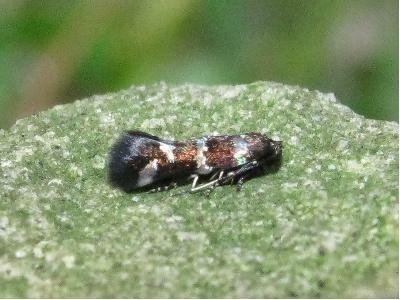 record for the species since 1916, although a few days later the species was also found on Cleeve Common near Cheltenham. The larva feeds on Thyme, and like other species in the genus it lives inside a tubular case from which it mines into a leaf after cutting a circular hole in its surface. The case is made from a mined-out foodplant leaf and silk. Wingspan approx. 12mm, the forewings are narrow and pale brown with a white leading edge for part of their length. 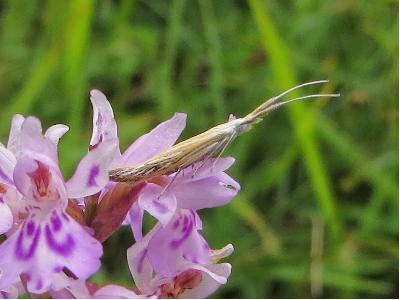 The species is quite similar to several others in the genus, but it can be recognised from the combination of its wing markings and its plain white unringed antennae (see photos below). Also found here in 2013, 2014, 2015 & 2017, with records from late May to early August. Epermenia profugella, pRDB2. A male of this species was found in August 2012, the first Glos. record since 1983. It was taking nectar on a flowerhead of the umbellifer Burnet-saxifrage (Pimpinella saxifraga), which grows abundantly on the grassland and is one of the larval foodplants for this species. The moth is small (wingspan approx. 9mm) and plain dark brown (photos below). Also found here in 2014 & 2015, with records from late July to mid August. Another new site for the species was found nearby in 2015. 4 species rated "Nationally Scarce A" (also known as "Nationally Notable a", abbreviated to "Na") have been recorded at Rough Bank since 2012. These are species believed to occur in from 16 to 30 10Km O.S. map grid squares in the UK. 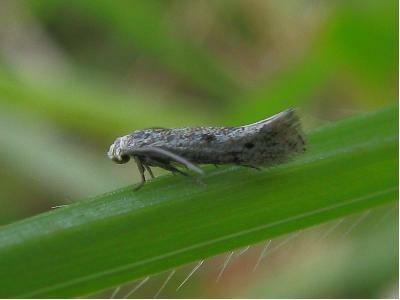 Trifurcula cryptella. Similar in size to T. headleyella above and with only a slight pale mark on the dark forewing. The larvae of this species mine the leaves of Bird's-foot Trefoil (Lotus corniculatus) and the adults have been recorded from the end of April to mid May. The species has also been recorded at two other Cotswold sites in recent years. Digitivalva perlepidella. This species is quite widespread in the Cotswolds, usually being recorded as larval mines in the leaves of Ploughman's Spikenard (Inula conyza), mostly in April. The adults are easy to identify from their forewing markings, but are rarely seen. Wingspan approx. 11mm. Larval mine and adult are shown below. 42 species rated "Nationally Scarce B" (also known as "Nationally Notable b", abbreviated to "Nb") have been recorded at Rough Bank. These are species believed to occur in from 31 to 100 10Km O.S. map grid squares in the UK. 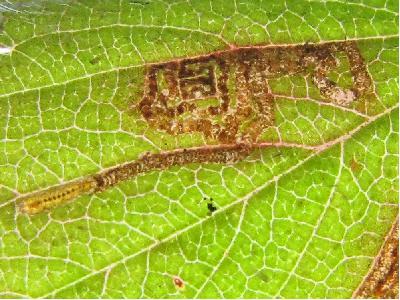 Stigmella aeneofasciella. Mostly recorded as larval leaf-mines on Agrimony in autumn, there are recent records of this tiny species (photo below left, wingspan approx. 5mm) from three other sites within a few miles of Rough Bank and from a site in the Severn vale. There are two generations each year. Adults have been found at the end of April. The vacated mines below were found in November. Nemophora metallica. 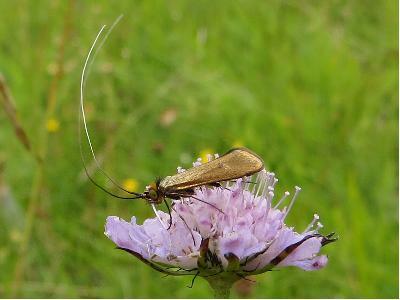 One of the "longhorn" moths with very long antennae relative to the body size (particularly the males). 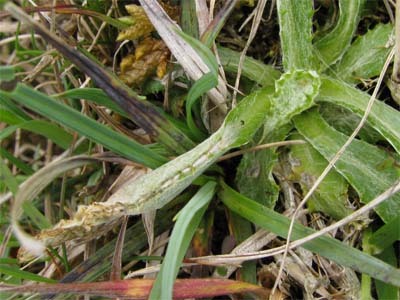 Found on many unimproved Cotswold grassland sites, its larval foodplants are Field and Small Scabiouses. Adults (wingspan approx. 18mm, photo of male below left) are mostly found in July and August. Nemophora cupriacella. Smaller than N. metallica, slightly larger than N. minimella (see below) and quite similar in appearance to that species, this species is parthenogenetic. Only females are found, and these lay fertile eggs without mating. In the photo of the female (above right) the antennae thicken more noticeably towards the base than those of N. minimella (below right). New to Vice-county 33 (East Gloucestershire) when found at Rough Bank in 2012, it has since been found at a few other Cotswold sites. The adults are usually found in late June or July. Larval foodplants are Field, Small and Devil's-bit Scabiouses. 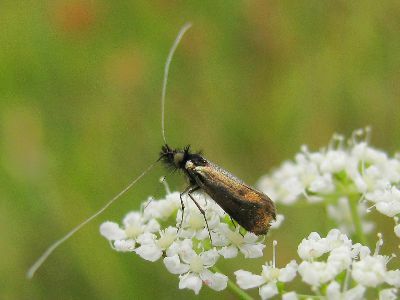 Nemophora minimella. Larvae of this species feed on Small Scabious or Devil's-bit Scabious. Adults (wingspan approx. 12mm) are found in July and August. Recorded from three other Cotswold sites since 2000. Photos below of male (left) and female (right). Parectopa ononidis. Recorded from several other sites in or near the Cotswolds. The larvae of this small species (wingspan approx. 8mm) mine the leaves of Restharrows or Clovers. The narrow forewings are dark brown with several silvery streaks inwards from the leading and trailing edges. First generation adults have been recorded in May or June, and second generation from mid July to late August. Ochsenheimeria taurella. Recorded in only a few sites in the county, adults of this species have their antennae noticeably thickened by scales for more than half of their length (photo above right). 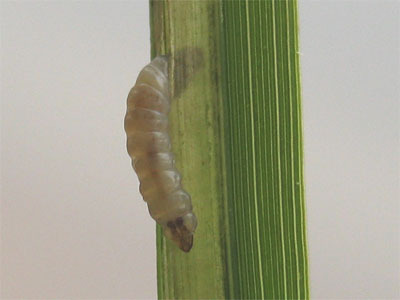 Larvae feed on various grasses, and adults have been recorded in July and August. Wingspan approx. 12mm, some forewing scales are loosely attached and give the mottled brown wings a rough appearance. Agonopterix nanatella. First found at Rough Bank in 2012 but not previously in the county since 1937, this moth has buff forewings with a thick scattering of darker scales, wingspan approx. 16mm. 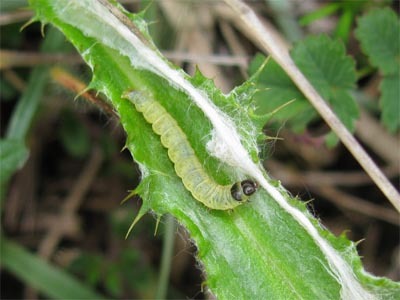 The larval foodplant is Carline Thistle - the photos below show a leaf-tube formed by the larva using its silk, and a tube opened to show the larva. Adults fly at dusk and come to light, and have been recorded in August. In recent years also found on several other Cotswold grasslands. 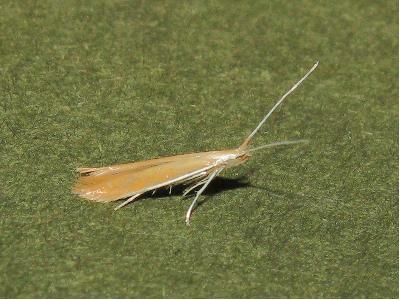 Coleophora lixella. Found in June and July at several sites across the Cotswolds. Larvae of this species feed initially on Thyme and later in their development on grasses. 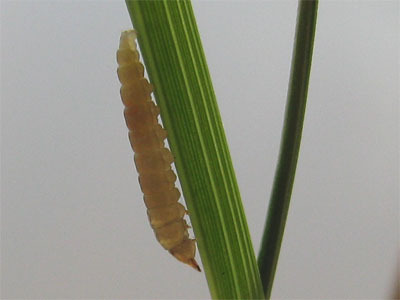 Photos below of a larval case made from part of a grass leaf, and an adult (wingspan approx. 18mm). Stephensia brunnichella. 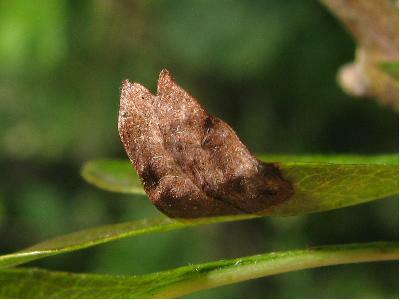 A small brown moth with silvery markings (wingspan approx. 8mm, photo below). 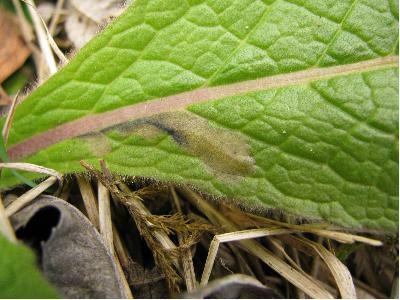 Larvae of this species mine the leaf-tips of Wild Basil. 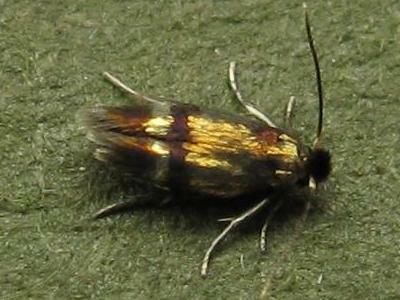 It has been recorded at numerous Cotswold sites either as adults or as larval mines. First generation adults mostly fly in May and June, second generation in August and September. 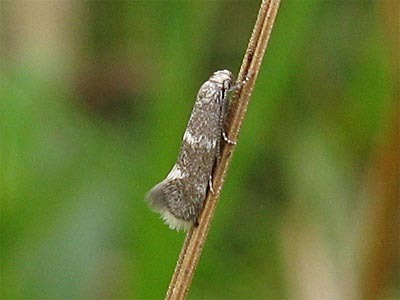 Elachista species. The species listed below from this genus are all small, with wingspans in the range 7 - 10mm. Their larvae feed on sedges &/or grasses. 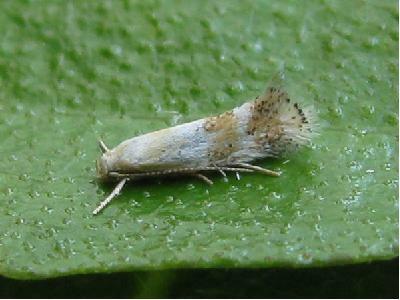 Elachista subocellea. Forewings with three broad yellow-brown stripes (faint in some specimens, particularly worn ones) across pale wings with scattered dark scales. Photos below of a well-marked specimen and a worn one. Recorded from sites across the Cotswolds and a few in the Severn vale, mostly in June and July. 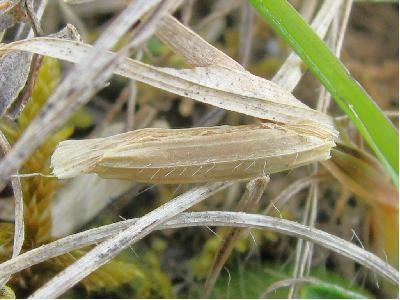 The two photos above show a fully-fed larva leaving its mine in a blade of Tor Grass, and on its way down the grass stem (it later pupated near ground level). 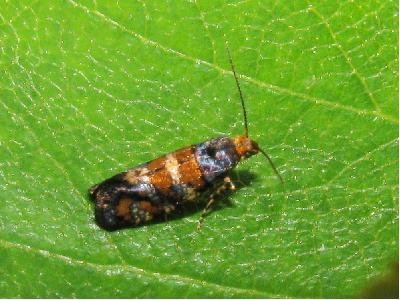 Elachista biatomella. Forewings pale with scattered dark scales giving a greyish appearance, with two prominent dark spots (photo below left). Worn specimens lose some of the greyish effect, as in the photo below right. 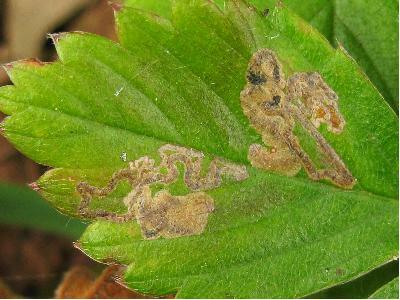 Very worn specimens can resemble E. triatomea. Recorded from sites across the Cotswolds, seen from April through to mid September, with most in May and June. 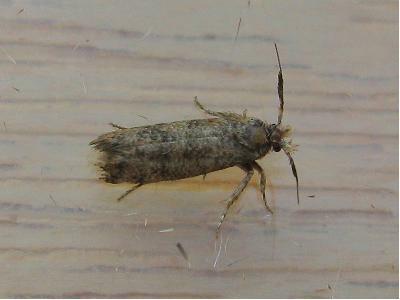 Elachista subnigrella. Male forewings greyish with faint paler markings, the females showing more contrast with a darker background, a pale stripe across the middle of the wing and two pale spots beyond this (one on the leading edge, the other on the trailing edge). Recorded from several Cotswold sites, records from April through to August. Mompha terminella. Recorded in Cotswold woodlands and the Forest of Dean, this species is usually found as the distinctive larval leaf-mines on Enchanter's Nightshade (photo below), mostly in September, rather than as adults in July. Wingspan approx. 8mm, forewings dark orange with various white, grey and darker markings. 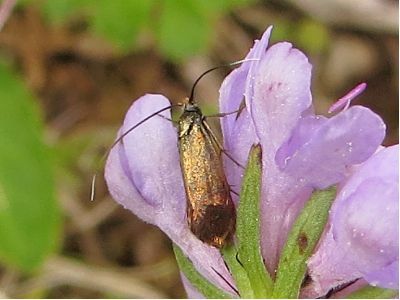 Scythris picaepennis. This is a small, very dark moth (wingspan approx. 10mm). 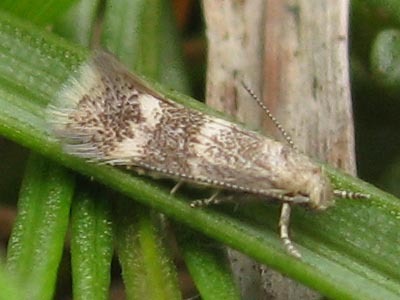 It is often unmarked and very similar in appearance to S. subcinctella below, but it sometimes has a scattering of paler scales on the forewings. This species uses Thyme and Bird's-foot Trefoil as its larval foodplants. 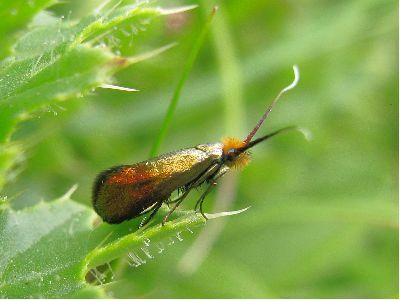 It is found on many Cotswold grassland sites, in a single generation mostly from late May to July. 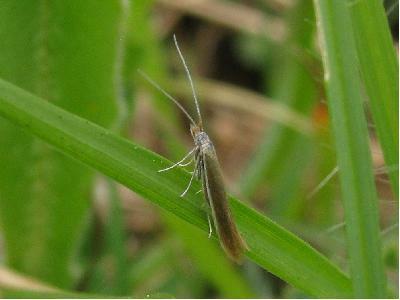 Scythris subcinctella. Also found on many Cotswold grassland sites, this small, plain dark bronzy moth uses Common Rock-rose as its larval foodplant. Wingspan approx. 10mm. Described in some books as univoltine, it has two generations here: adults are mostly recorded from late May to July or early August, and again from late August through September. Photos of nectaring groups of second generation adults below, taken at other Cotswold sites on 18 September 2012 and 22 September 2013. Small Plume (Oxyptilus parvidactyla). 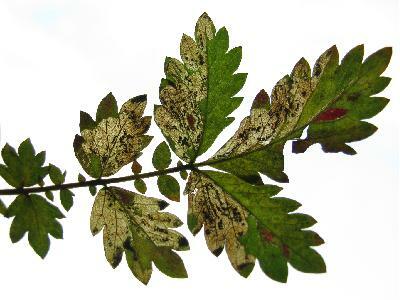 Found on many Cotswold grassland sites mostly southwards from Cheltenham. Larvae of this species feed on Mouse-ear Hawkweed. Adults have been recorded from late May to mid July. Photo below left, wingspan approx. 14mm. Aethes hartmanniana. 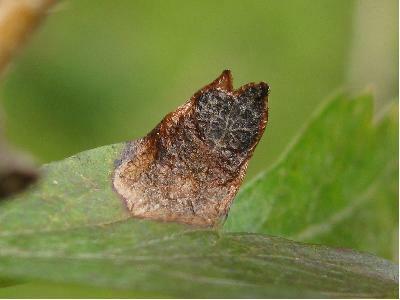 This tortrix moth has almost identical markings to A. piercei below, but is smaller on average. Its wingspan is usually in the range 11-17mm, compared to 15-24mm for A. piercei. Its larvae are thought to feed in the roots of Field or Small Scabious; those of A. piercei feed in the roots of Devil's-bit Scabious. Each species has been recorded at very few sites in the county, from May to July. Photo above right. Rhopobota stagnana. Found on several Cotswold grassland sites. The larvae of this species feed on Small and Devil's-bit Scabiouses. There are two generations: adults are mostly recorded from early April to early June and from mid July to mid August. The males (photo below left) are obscurely marked, the females (photo below right) have much stronger contrast between the paler and darker areas. Wingspan quite variable, averaging approx. 15mm in the male and 12mm in the female. Six-belted Clearwing (Bembecia ichneumoniformis). Common enough at Rough Bank to be found quite easily without using its pheromone lure, this species is widespread in the Cotswolds and is also found elsewhere in the county. Larval foodplants are Bird's-foot Trefoil, Kidney and Horseshoe Vetches. Mostly recorded from mid June to mid August. Photos of male (left) and egg-laying female below. Hypochalcia ahenella. Found on several Cotswold grassland sites. The larval food is uncertain, Rock-rose is thought to be a possibility. Recorded from mid May to early July, adults are very variable in both size (wingspan 22 - 32mm) and shade of brown, with some specimens much darker than the two shown below. Mocha (Cyclophora annularia). Found mostly in woodland in southern and western parts of the county. 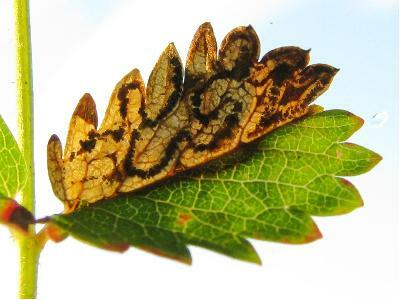 The larval food is Field Maple. Recorded in two generations, mostly in May & June, and again from late July to the end of August. Photo below left. Blomer's Rivulet (Discoloxia blomeri). This species has been recorded in many places in the county, mostly in the Forest of Dean area and the Cotswolds from Cheltenham southwards. The larvae feed on Wych Elm. Adults are mostly recorded from mid May to August, sometimes found at rest in the daytime (as in the photo below left) but often recorded using UV light traps. 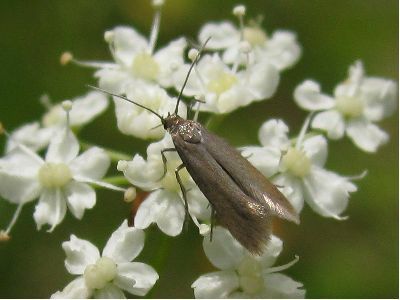 Drab Looper (Minoa murinata). Recorded in many woodland areas in the county. The larval foodplant is Wood Spurge. Adults fly in the daytime, with most records from mid May to early July but some from a partial second generation until late August. Photo above right.